It’s something I’ve been wondering about on and off for a while, too, and I’m glad she really made me sit down and think about it. Like her Mimosa, my kitties aren’t exactly the most graceful and can fall pretty hard – even if, especially if, they land on all fours. So are our CH cats more likely to get joint pain like arthritis? I decided to look into it. First off, what are we talking about? What exactly is arthritis / joint pain? Throughout life a cat’s normally smooth cartilage surfaces of the bones begin to erode. The cartilage is important because it acts as a buffer or cushion between bone surfaces. When it becomes damaged, the body tries to repair it, but the new surface may be irregular or incomplete, which can cause pain by itself let alone the additional inflammation that can occur when the bones touch. This condition is known by many names, including degenerative joint disease (DJD), arthritis and osteoarthritis. 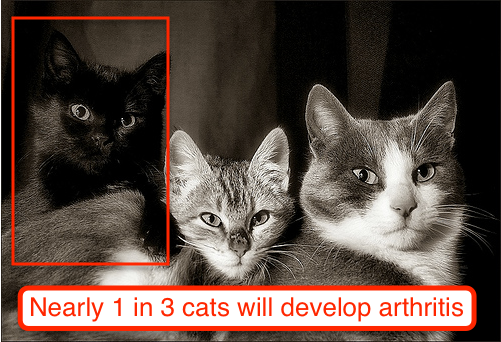 Age: Arthritis is more common in middle-aged and older cats, as joints naturally degenerate throughout life. Injury: Joints that have been injured in the past are more prone to becoming arthritic later on. Plus, joint dislocation or an infection at the joint can also increase its chances of having arthritis. This is likely the one CH cat parents should be most concerned with, and some vets say rightly so. Even trama early in life like falling off a sofa, falling down stairs and the like may lead to issues later in life. If possible, try to CH cat-proof your home to keep your cat safe. Obesity: Weight can also play a major role in joint pain. Overweight cats can be especially prone to joint pain since the excessive weight places greater strain on the joints. Similarly, poor nutrition, like high calorie carbohydrate-based diets, can contribute to cartilage defects. Birth defects: Some congenital abnormalities, like hip dysplasia, can increase a cat’s chances of having arthritis. Which joints are impacted most often? Large joints in the body, like the shoulder, elbow, hip and ankle are most frequently affected. That said, all joints can be affected, such as the spine. How many cats get arthritis? Now this is the answer that really shocked me. Studies have actually been done on this, and researchers found out that at least 30% of all felines 8-years-old and older suffer from some degree of joint pain. And quite honestly, it could be more than that. Some believed that cats were less likely to suffer from arthritis than other species, but as we know, cats are pretty good at hiding their pains and health issues. Keep checking back over the next few days to learn the signs of arthritis in a cat. I didn’t know the percentage was that high! Thanks for that info, and may I pass on that glucasomine works for cats as well as for humans – if you can persuade them to take it, as it’s only available in human sized pills and has to be ground up and added to their food. Which with the clever ones is a non-starter. Thank you for this post! Almost no one responded to my question on the Facebook page, so I was worried that no one had any information or input. I was hoping no news was good news! Look forward to the next post re: arthritis signs. i just stumbled across this blog & wanted to say THANK YOU! my cat digger is a CH boy, & i am forever trying to sell people on the merits of adopting special needs kitties. this is a wonderful resource! great job! Tardy was on Cosequin for the last few years of his life, it really helped him a lot! Since I worked for a vet for 12 years, I went with the product she (and the other vets I used) recommended. It comes in a little capsule that you open up and sprinkle on the food, it’s chicken flavoured, Tardy loved it. I miss him so much, I still find myself sobbing uncontrollably, my heart feels like it’s been cut in half. My cat had vaccine associated sarcoma and now she has arthritis. However she doesnt have CH, and she never hurt her legs.